Note: In a testament to the terribleness of the user experience of watching programs on CBS’s website, I accidentally watched the second episode of Partners instead of the pilot (another issue with the CBS.com experience mentioned later). I had already written a substantial part of the review before I realized I watched the second episode and had an internal debate over whether I had to go back and watch the pilot, especially because, as you’ll read, this is a show I never wanted to watch again in my life. I settled on the compromise of playing the episode, but not being committed to the level of concentration I normally afford a pilot. Be forewarned though, that I may reference second episode events, in case you plan on being an avid Partners watcher. It was a race to get in this review of Partners in before the show’s near inevitable cancellation. A few days ago, I declared Guys with Kids the worst new show I had seen so far this season. Well, ladies and gentleman, we have a new champion. First, if I’ve said this once, I’ve said it a thousand times, and it’s going to reach that number eventually, but laugh tracks are terrible, for so many reasons. They’re loud, they waste time, they’re insulting to the audience, they screw up timing, etc, etc, etc. Enough, let’s move on. Oh, and there’s also an obnoxious clapping sounds between scenes which is just supposed to indicate transition but is a really poor sound choice. There’s no one passage I can dissect and tear to bits like in now Monday night stalwart 2 Broke Girls’ debut, and it’s less particularly offensive to one certain type (New York, hipsters) than it just offensive to people with senses of humor. Partners is the story of four people (one of the few shows in fact, where I recognize all the main cast members, albeit there are only four). 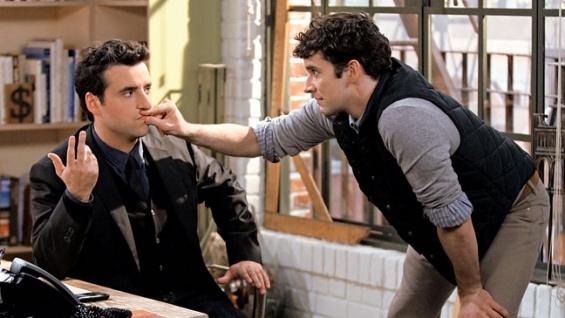 Two are best friends and architectural partners at work, Joe (Numb3rs and Harold and Kumar vet David Krumholtz) and Louis (Ugly Betty’s Michael Urie). They clearly go back a ways and care very much for each other. They’re both involved in serious relationships with Ali (One Tree Hill’s Sophia Bush) and Wyatt (Superman himself, Brandon Routh), respectively. The trouble of course comes in when they both meddle substantially in each other’s relationships. Basically, it’s just painfully unfunny. Some sitcoms I deride as old-fashioned. This is that, but it’s a a pretty lousy old fashioned sitcom; it would have been bad at any point in time.. There’s so much classic miscommunication in just two episodes it blows my mind. Both episodes I watched were actually incredibly similar featuring Louis both causing and solving problems of Joe’s by talking to Ali, hammering home the central joke that Joe and Louis are in a relationship with each other, just like they are with their fiance and boyfriend, respectively. There’s even a extremely sassy non-whit female assistant. Even the small percentage of jokes that have seeds of potentially working are murdered by a combination of the laugh track, poor timing, and simply not enough care. Most “jokes” though don’t even make it to that level, being fundamentally faulty. A couple of more notes on how terrible the CBS.com viewing experience is. It’s hard to click and get the episode you want. The repetitive commercials on Hulu have always been a source of complaint, but CBS showed me this absolutely terrible Macy’s ad FOUR times in a row. There is absolutely no excuse for that. One last note: Also appearing as Ali’s dopey, borderline mentally challenged assistant is Jillian Bell, who is best known for playing the dopey, borderline mentally challenged bosses assistant on Workaholics. Will I watch it again? Absolutely not. Do I even need to explain further? It’s wretched. Do not watch. Luckily, by the time you read this, it may not even be an option.